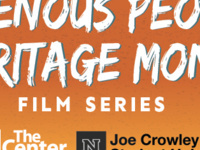 This movie series is intended to celebrate the American Indian and Alaskan Native heritage and help students gain a better understanding to build a better community. Arnold rescued Thomas from a fire when he was a child. Thomas thinks of Arnold as a hero, while Arnold's son Victor resents his father's alcoholism, violence and abandonment of his family. Uneasy rivals and friends, Thomas and Victor spend their days killing time and arguing about their cultural identities. When Arnold dies, the duo set out on a cross-country journey to Phoenix to retrieve his ashes.